You may not be great about keeping the bird feeders always filled, but if you love gardening, you can choose plants that will bring more feathered friends into your backyard. We have so enjoyed watching our gardening efforts provide not only beautiful flowers for us to view, but also food for the many bird species we have attracted with plants, feeders and a birdbath which is a favorite for all. Water sources are many times very hard to find for birds. 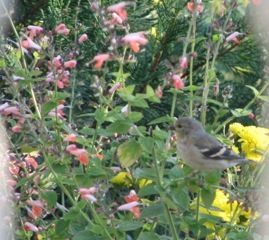 The American Goldfinches enjoy eating the seeds from the Black-eyed Susan flowers when the bloom dies off (view video). Here's an article about 10 great flowers that offer seeds for birds.